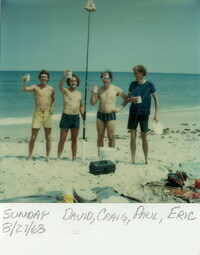 Since moving to Indialantic in '76 I became good friends Craig, Paul and Eric who all worked at Harris. The four of us did quite a bit of fishing together from the beach, jetties and a trip to Bimini. When we went beach fishing I think we did more drinking beer then fishing as I seldom caught anything. 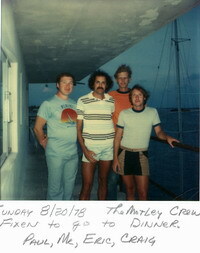 Craig, Eric and I went on a three day fishing trip to Bimini in the Bahamas, we were quite a motley looking crew. We left the from the Pompano Beach aboard the Helen S. on a Friday for the trip over getting there early enough to do a little fishing. We then fished all day Saturday and it early afternoon Sunday. Friday and Saturday nights the boat put into port at Bimini and we had dinner at a restaurant and then stayed in a hotel on the island. The picture right was at the hotel. On the way over they took up a pot of money for the largest fish each day and the largest fish of the whole trip. We all caught a few five to even 20 pounders but non were winners. That was until the last day. 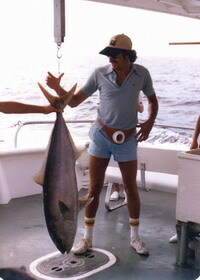 We fished all morning and into the early afternoon when the captain said to haul up our lines we were heading home. Just at time I had a big strike. Everyone else had brought in their lines except for me. I then fought the fish for about twenty minutes with the captain moving the boat around so it didn't get caught under the boat. I finally wore out the fish and brought it in to find it weighed 52 pounds to win the pot for the day and for the trip. Also that year Craig, Paul and I took a scuba diving course at Hatt's Diving Headquarters in Melbourne from the instructor Jim Bobb. We did a lot of diving together recording five dives in my dive log that year. The check out dive was in West Palm Beach which was a great place for a first dive. We also went down to the John Pennekamp park in Key Largo, some springs in central Florida and my brother David and I to Crystal River.